A diagram of the major components of an adult human testicle, including the following numbered items: 1. Tunica albuginea, 2. Septula testis, 3. Lobulus testis, 4. Mediastinum testis, 5. Tubuli seminiferi contorti, 6. Tubuli seminiferi recti, 7. Rete testis, 8. Ductuli efferentes testis, 9a. Head of epididymis, 9b. Body of epididymis, 9.c Tail of epididymis,10. Vas deferens, 11a. Tunica vaginalis (parietal lamina), 11b. Tunica vaginalis (visceral lamina), and 12. Cavity of tunica vaginalis. For other structures with the same name, see Tunica albuginea. The tunica albuginea (/ˈtuːnɪkə ˌælbəˈdʒɪniːə/ US dict: tōō'·nĭ·kə ăl'·bə·jĭn'·ē·ə) is the fibrous covering of the testis. It is a dense blue-grey membrane, composed of bundles of white fibrous tissue, from which it derives its name albuginea (wiktionary:albuginea), which interlace in every direction. 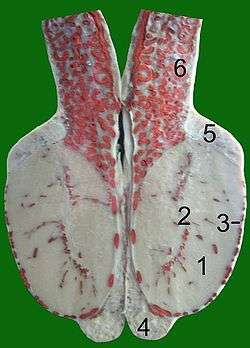 The tunica albuginea is covered by the tunica vaginalis, except at the points of attachment of the epididymis to the testis, and along its posterior border, where the spermatic vessels enter the gland. 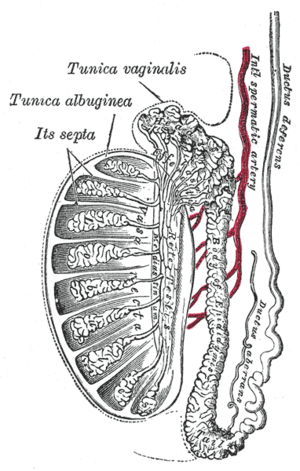 The tunica albuginea is applied to the tunica vasculosa over the glandular substance of the testis, and, at its posterior border, is reflected into the interior of the gland, forming an incomplete vertical septum, called the mediastinum testis (corpus Highmori). Transverse section through the left side of the scrotum and the left testis. Section of a genital cord of the testis of a human embryo 3.5 cm. long. Vertical section of the testis, to show the arrangement of the ducts. Anatomy photo:36:11-0102 at the SUNY Downstate Medical Center - "Inguinal Region, Scrotum and Testes: The Cross-Section of the Testis"